In 1707, eight-year-old Sarah travels with her father to build a new home in the Connecticut wilderness. Sarah is afraid when she hears animals in the night. She is afraid when she meets her Indian neighbors. She is especially afraid when she is left with an Indian family while her father goes back to get the rest of their family. But when Sarah remembers her mother's parting words, "Keep up your courage, Sarah Noble," she learns to be brave even when she's afraid. Through Sarah's example, young listeners will learn much about courage, faith, and inter-cultural friendship. 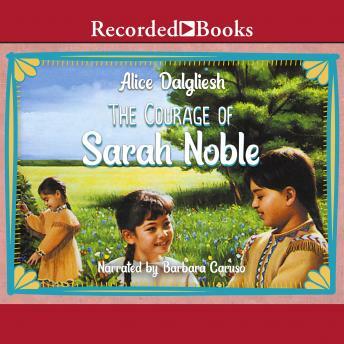 Based on a true story, The Courage of Sarah Noble also teaches children about colonial life in America. Alice Dalgliesh has written many well-loved books for young people. When heard in narrator Barbara Caruso's friendly tones, this distinguished contribution to children's literature becomes even more inviting.